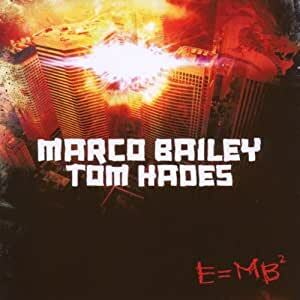 E=MB2 sees Marco Bailey team up once again with long term studio partner Tom Hades for his first artist album since 2004's Rudeboy. Marco Bailey should by now need little introduction. Fifteen years of sacrifice and dedication have seen Belgium's number one DJ break through the national borders to join the big league of worldwide techno artists and Marco Bailey's productions frequently appear in the set lists of Carl Cox, Laurent Garnier and Sven Vth. Here, Marco and Tom explore their favorite exploits into the underbelly of the nocturnal club environment. At times cinematic and even touching on rock influences, electro, minimal and of course, peak-time techno, Marco and Tom flex their collective studio muscle into new twisted forms. From the opening guitar-flecked "Adult Entertainment" to the hypnotic, tunnelling techno of "Blast," the thumping electro-bass of "Rhythm Is My Life," the rolling piano of "Childhood," the downtempo subtlety of "Caf Latt" and the closing "Final Arrivals," Marco Bailey and Tom Hades show a more mature artistic side to their studio work.